This is a heavy sinking minnow meant for offshore migratory fish species like Bonito, Tuna and Dorado. The lips of heavy lures tend to get thick and bulky to ensure sufficient action and durability. We created a sharp body with a metallic lip that gives the lure a great ‘wobble and roll’ action response that attracts fish very effectively. Also, the flat sides of the body create a flashing effect. It not only responds well at high speed retrieval for Bluebacks (Yellow-tail, Kingfish, Amberjacks, etc) but is also great at medium speeds for seabass. The weight of this lure has made it possible to reach a deep range with “lift and fall” techniques and natural drifting. We have employed a “rolling swivel” for the hook-eye to give the lure more strength. With this design, breakage of the lure is less likely, as is the chance of hooked fish getting free. 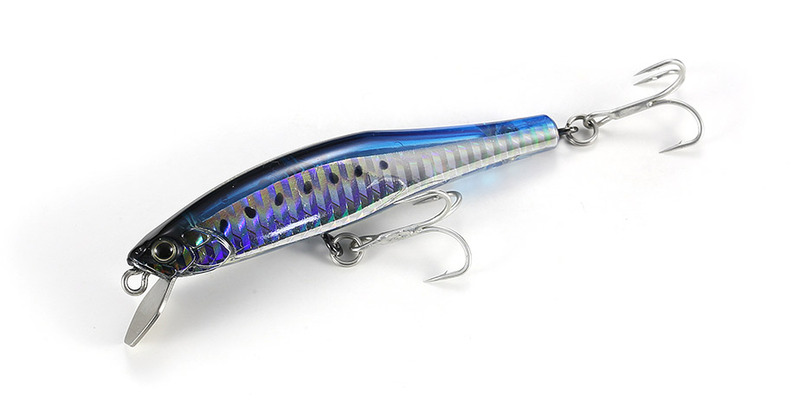 Why don’t you try this uniquely designed Larus Minnow!